I had my first heartburn throughout my pregnancy. And boy am I glad this was the only time. The feeling was TERRIBLE. I kept burping my dinner the whole night and up till when it was bed time, the moment I lie down, I want to vomit. It lasted about an hour before I decided to do something about it. It was too terrible to tolerate. I remembered that one of the goodies bag I took had some heartburn relieve samples and went to dig for it. It's a liquid sachet form of heartburn relief from Gaviscon. I am glad for this. I felt better sometime after taking it. 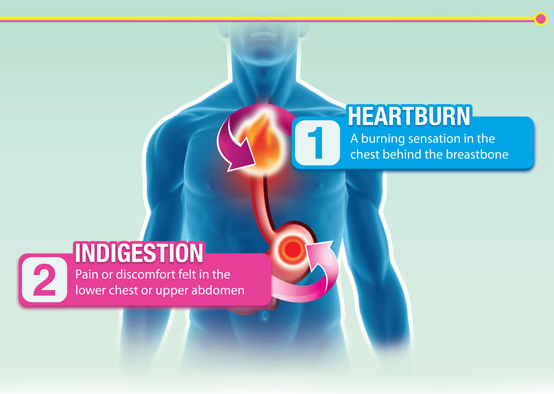 Heartburn is a symptom created by acid reflux, which results in the diagnosis of gastroesophageal reflux disease (GERD) if it persists and happens more than twice a week. It is a very common symptom described by an internal burning pain felt around the lower chest area. Heartburn is felt when stomach acid flows back up into the food pipe - the gullet, down which food moves from the mouth to the stomach.